Ford Farms Mature Cheddar in striking wax truckle, over-wrapped in parchment paper. Aged 12 months for added flavour. 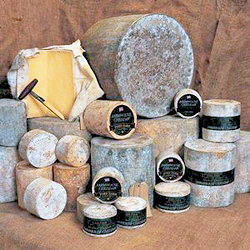 Award winning farmhouse cheddar, in a 600g Mini Truckle from the Ashley Chase Estate, Dorchester. More about Ford Farm ... As you walk across the fields and through the woods to the cheese house, admire the spectacular views of the sea and marvel at how this grass becomes cheese available in shops both in nearby villages and oceans away. Ford Farm`s home is by the sea in a lovely part of Dorset, about 1.5 hours from The Cheese and Wine Shop. More about the West Country Farmhouse Cheddar 600g ...this Mature Cheddar has a wonderful flinty texture and a distinctly savoury flavour with a refreshing sharpness. Care Details; Keep in larder, or chilled. Cloth wrapped; Remove before use.